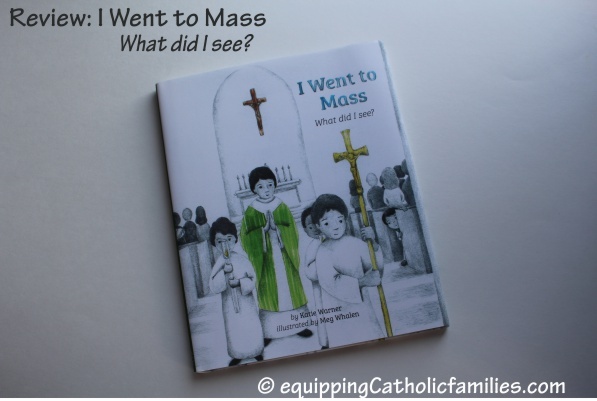 Review: I Went to Mass, What did I see? What an awesome book this is for young Catholic kids! I received I Went to Mass What did I see? by Katie Warner and illustrated by Meg Whalen in exchange for my honest review…and it is such a sweet book! 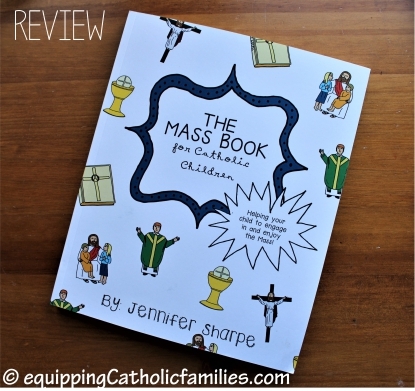 The Mass Book for Catholic Children is a delightful book by Jennifer Sharpe and illustrated by Kristen Rabideau of Drawn2BCreative. 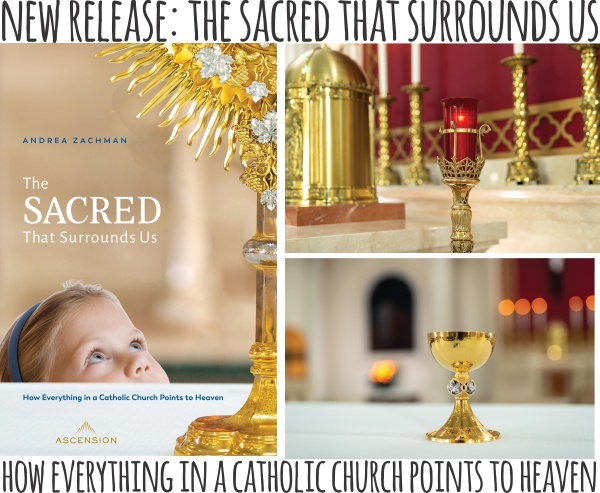 This beautiful Mass Journal offers 3 straight-forward, repeated templates throughout the book with nice illustrations, big print and ample space to record key words and prayers, draw, color and check boxes for good behavior. The truth is…my hearing isn’t so great. I have a little trouble hearing the readings if the reader isn’t perfectly clear and if there is someone rustling a cough candy wrapper in the next pew. I find it much easier to focus if I’m following along with the readings as they are read. 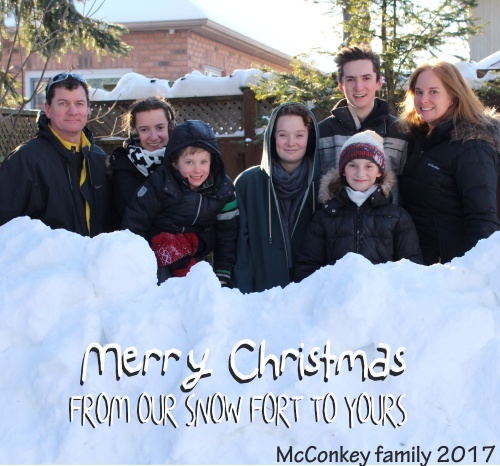 Our kids range from 21 years down to 7 years old. 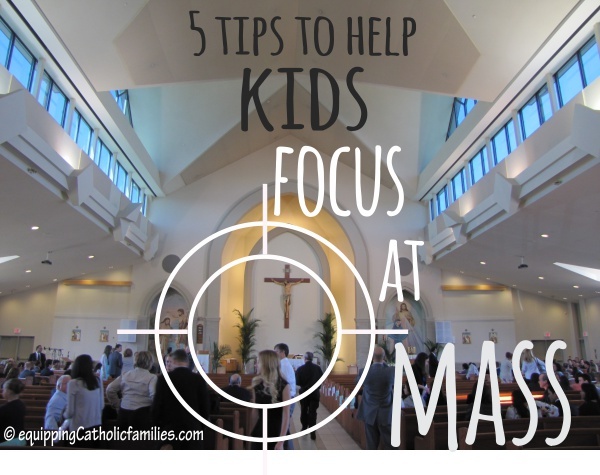 Here are a couple tips we have found that have helped kids focus at Mass. When the kids were a lot younger, I found myself kind of overwhelmed at Mass with them, especially when Bill was travelling and I was going it alone…with the kids. Church is only a 5 minute drive away, but I found that when I took the time to list ‘the rules’ and get the kids to repeat them after me, sometimes a look or one word could reign them back in. 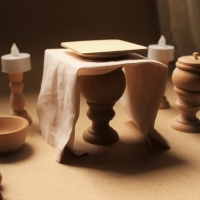 After 21 years of parenting, I still haven’t achieved the look my mother-in-law mastered that could keep even the most wiggly boy in check at Church, but our Mass Mantra has helped….along with the odd bout of bribery good behavior reward after Mass. It’s hard to believe that Adam is going to be seven this week! Last year, I made a Play Mass kit for Adam…and I love the way it turned out! 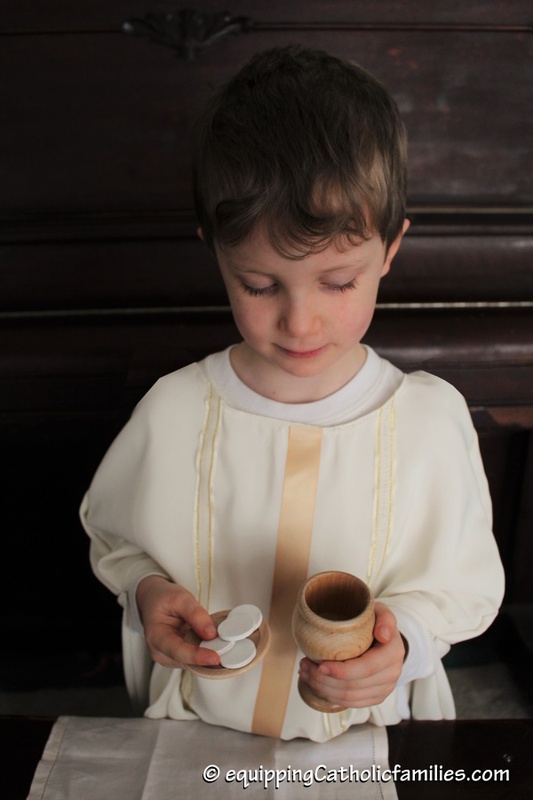 He was doing fine with his Play Mass Kit, but I decided to make him his own priest vestment…a Chasuble. I bought a metre of no-wrinkle white fabric, some ribbon and some ribbon-sized heat bond (iron-on adhesive).